Wear one or many. Share the love and give them as gifts. Colorful bracelets help women artisans in India lead better lives. 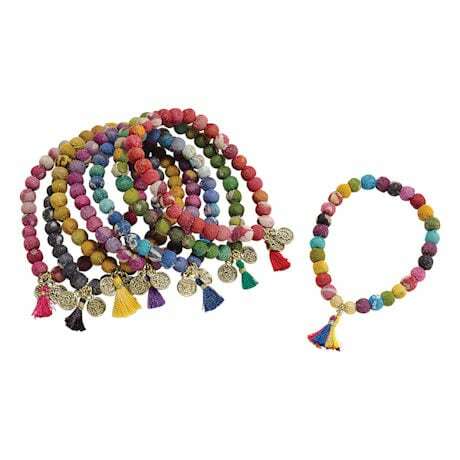 Beads are recycled Kantha cloth wrapped around repurposed wood, accented with tassels and bright metal charms. Specify Unity (rainbow), Energy (red), Growth (green), Serenity (blue), Wisdom (purple), Hope (yellow), Strength (black), or Compassion (pink). Bracelets stretch to fit most wrists. 8" length. Fair Trade items from India.